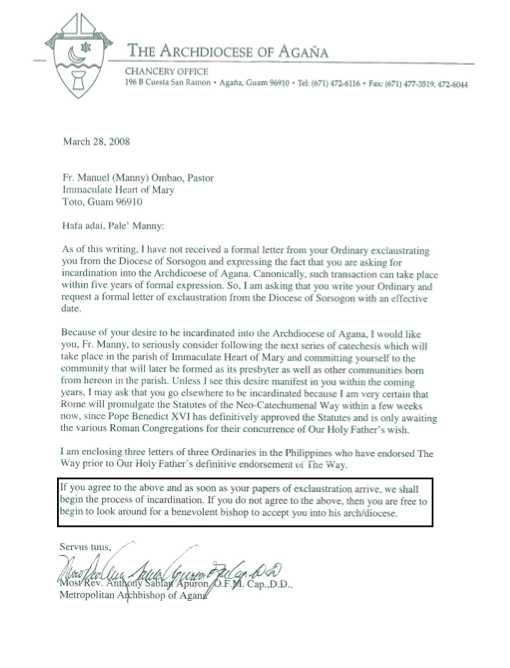 In 2008, the laity rose angrily to the defense of three priests from the Philippines who had been threatened by Archbishop Apuron. Apuron had demanded that they serve the Neocatechumenal Way or leave the Archdiocese of Agana. 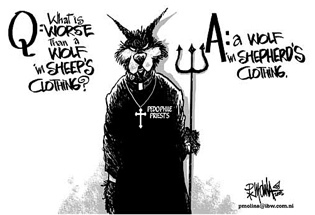 One priest, Fr. Manny Ombao, had been in Guam for nearly three decades. Armed with signs and placards, a band of Catholics yesterday protested across from the Dulce Nombre de Maria CathedralBasilica for what they believe is a dividing of Catholicism. Group members said the protest was not against the Catholic church, but rather the Neocatechumenal Way movement, which they said members of the clergy and Archbishop Anthony Apuron were promoting. 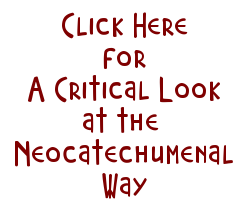 The Neocatechumenal Way "has the ultimate goal of bringing the faithful gradually to the intimacy with Jesus Christ and to make them active members of the Church and credible witnesses of the Good News of the Savior everywhere," according to its Web site. But Toto resident Lou Bamba said that a person must be invited to attend a Neocatechumenate gathering, whereas the Catholic church freely welcomes anyone. Bamba said her understanding of the Neocatechumenal convocation is that the group brings non-practicing Catholics back into the church, and converts non-Catholics into believers. "It's creating a major division in the Catholic church," Bamba said. 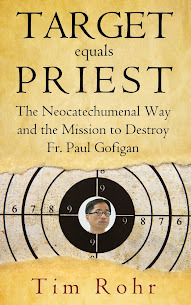 "The archbishop is personally involved in this Neocatechumenal movement, ... and we feel that it is dividing the three main family institutions that make up the Catholic faith the clergy, parish and biological families." Never before in the recorded history of 400 years of Catholicism on Guam had Catholics stood publicly against their bishop. But on this day they did. And it was the beginning of the GREAT DIVISION. Because present at the Jubilee Mass was the Cardinal of Cebu and the then-Apostolic Delegate to Oceania, Archbishop Charles Balvo. The protest was a major embarrassment for Apuron and in retaliation he soon kicked RMS into overdrive. He would get his revenge on us. And he almost did. However, sad to say, he still might. If Bill 326-33 does not become law, Apuron may yet escape any liability as his personal assets may not be enough to sustain legal action against him for long. What makes this incredibly sad and ironic is that Fr. Ombao, the priest so many of the laity put themselves at risk for in 2008 spent a full eight minutes at the end of Mass this Sunday, not to read Hon's letter, but to personally advocate for the Bill's veto! And during which he lamented: "If we lose, then most of our property will be sold to pay for, uh, the victims." And here is the letter Apuron wrote him in 2008. The letter which prompted so many people to save him. And now he turns on us. Protecting property is more important than "uh, the victims." Tim is it possible to post pictures of clergies from the various parishes since not all of us know them who are not members of their parish. We often see them out and about but can't identify them. Most of your priesthood was spent drunk. Turning against those who help you. No loyalty. Shame on you Father Manny. Apuron detested you why even support him? His eyes were bloodshot during the 6:30 PM Sunday Mass. And yes, he believes what the two attorneys said during the meeting with the clergy. Only a handful of parishioners were at the back to sign the petition. Tim, It's time to develop a pictorial log of "The Good, the Bad and the Ugly." We need to know who we're talking about, so we can confront them personally. Good idea, Bruce. I would like very much to know what Fr. Revoltin' Rudee looks like and now, also this ungrateful Fr. Manny Ambao. Let us put them up on a "wall of shame" for everyone to know who they are. Sure. Help me out everyone by sending me a pic of your parish priests with their names. I am from Toto and was one of the parishioners who picketed at the Cathedral in support of Father Manny Ombao in 2008. We were bullied and threatened to stop the protests by Archbishop Apuron and Msgr. David (the tall) by phone, by email and in person by Msgr. David when he personally came to our homes. People even in our own parish called us names for standing up for what we believed in. We put our names and reputations on the line for Father Manny. When he moved to Ordot we said we would continue to protect him no matter what. Now that it is Father Manny's turn to stand up for justice for children who were raped, he chose to defend the money that Apuron represents. I am deeply hurt that he could not return the same act of kindness for innocents who were victimized. Thankyou Fina. The example you provide is one of the many forms of bullying blackmail used by Apuron over the years. He has threatened priests with visa denial refusal of health care when sick. Unfortunately much more. He is a vicious malicious reckless evil man. However, for Manny ombow to protect child abuse is a scandal above all. Pale Manny has an ulterior motive. He's bucking to get incardinated here. Thus he's showing Jeff he's a good soldier. How sad. I believe we need a wall of shame where we post those ugly priests who clearly support Child Abuse in the Archdiocese of Agana Guam. They need to me named and shamed. Fr.Manny doubt people of Guam will want you here. Consider going back to PI after this.